Howard County District Administrative Judge Pamila J. 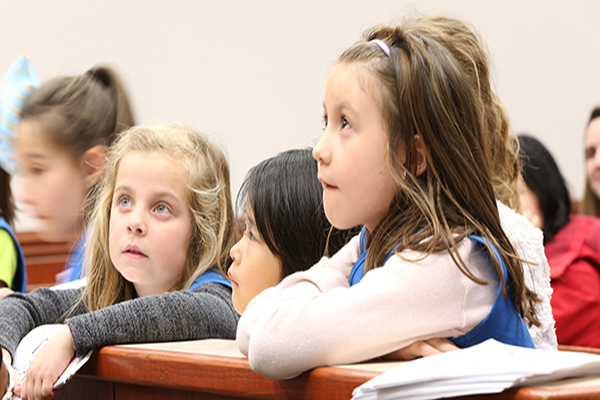 Brown recently hosted a group of Daisy Girl Scouts and educated the girls on the judicial system. Judge Brown met with approximately 10 first-graders from the Ellicott City-based Daisy Troop 987 and their families during their April 4 visit to Howard County District Court. She used coloring books to explain the legal system, answered questions from the girls, and discussed her role as a judge. “These visits are an opportunity for students, whether they’re first-graders or high school seniors, to get a first-hand look at Maryland’s system of justice,” Judge Brown said. The Daisies also gained hands-on experience with the courts when Judge Brown conducted a mock trial based on the fairy tale Goldilocks and the Three Bears. During the mock trial, the Daisies played each role in a court proceeding, including judge, defense, prosecution, and witness. The Daisies concluded their field trip to Howard County District Court with a brief tour of the clerk’s office and Judge Brown’s chambers. For their visit to the Howard County District Court, the Daisies earned “Honest and Fair” petals, which represent values of the Girls Scout Promise and Law.